Three years ago, I read a book, got inspired, and started a dinner club. End of story. Kinda. It wasn’t a book about dinner clubs necessarily, but the author wrote bits and pieces about her dinner club, and the value of those lifelong relationships, and the really good food they bonded over, and I was like: hold on. just wait a second. I NEED ONE OF THOSE AND HOW DO I GET THAT IN MY LIFE. Our first dinner club was in December of 2014. Since then, we have tried to get together monthly – or close to it – for a really good meal, cooked by all of us, and lots of conversation ranging from the more serious and vulnerable hardships in our lives to hilarious and self-deprecating stories that make us laugh until we cry. I have these beautiful, funny, food-loving people in my life that I get to call my really good friends all because of dinner club. So this is the “changed my life” part. If you’ve been reading the blog for the last year or so, you know that on January 1st, 2017, my husband Bjork and I lost our infant son Afton after a premature delivery and an otherwise healthy pregnancy. We spent a week in the hospital and about 15 hours with our baby in the NICU before he passed away in my arms. That time – well, this entire year, actually – has been a complete blur. It is really, really, really hard to bounce back from something like that, and I don’t know, even as I write that it feels too trite. Heal? Yes. “Bounce back?” I don’t think that’s a thing. This is really why I’m writing this post. It’s because the friendships developed over shared meals are the very same ones that have lifted me up in this really dark season of my life. And the magic? We became friends because of dinner club. That first night in December of 2014 when we all sat down around my table, looking awkwardly at each other in that WHAT IS THIS kind of way? That was the first night we met each other. It was the start of our collective food-based friendship, which then went on to support me through the loss of my son and, I hope, will go on to support each of us as life shapes our stories. As a result of spending the last two years sharing meals and stories and laughter together, this group acted as our first responders when things fell apart. They cried with me in my lowest of lows – in the hospital just hours after we lost Afton. They brought meals. They sent flowers. They gave me support on hard days when I needed it (Afton’s due date, Mother’s Day, my birthday) and they gave me space when it was too emotional for me to be around their new babies. They didn’t judge me for avoiding certain situations and showed me grace when I needed to bow out of hosting at the last minute. This hodge-podge group of girls (women? ladies? I am always conflicted with these terms) with different families, different personalities, different jobs, different politics and views on the world… the ones who didn’t know each other three years ago? They are now some of my very best friends. On a very serious note, THANK YOU, GNOCCHI. I firmly believe that we all want in on this. We all want connection. But most of us are just waiting to be invited. Idea: what if you were the one to send the invite? I don’t know, crazy, maybe, but why not? I know some of you are thinking: I wish I had a close group of friends like that / I wish people were there to support me on my hard days / I wish I could stuff my face with tacos and drink a grapefruit margarita and then laugh at funny stories until I cry. And I am here to say: You can have that. There’s nothing special about us – we just committed sharing good food once a month and developed these deep and supportive relationships as a result. Send the invite. Most people want in. They are just waiting to be invited. Also most people love saucy homemade chicken marsala and freshly tossed Italian summer salad and tangy artichoke dip and earthy red wine and buttery raspberry crisp. Even if the table talk gets awkward for two seconds, THINK OF THE FOOD. 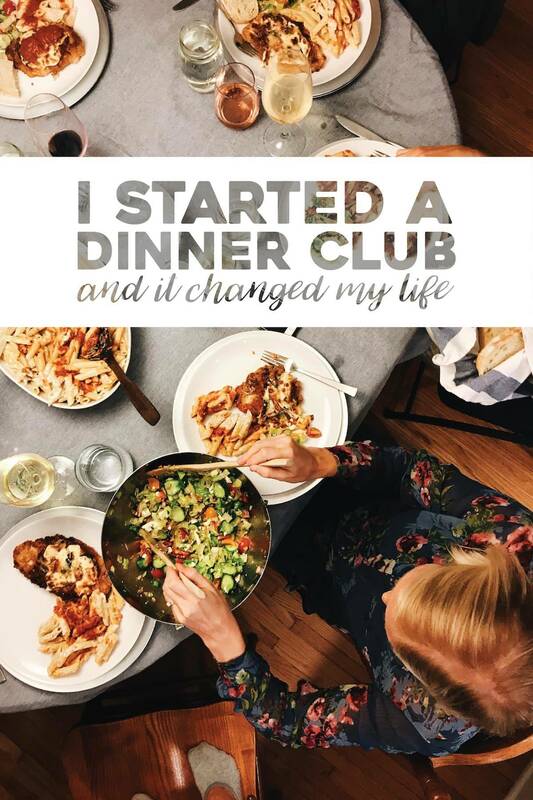 When I mentioned my dinner club on my stories last week, so many of you (like, hundreds 😳) reached out and asked for more information on dinner club – how it started, what we do, and how you can start one, too. This is my return message back to all of you! My thoughts on starting a dinner club. Choose the invitees. At this point you are the organizer, so you are the one to pick the invite list. Ideally these are people who love food. Anywhere from 6-10 people is a good number, but an odd number works too – we have 7 people in our dinner club. Ours is a girls-only club (my “girls” dilemma resurfaces once again but I really despise the term “ladies-only” so just let me have this one), but mixed company would be awesome, too. Choose who will host. This can be a set location or it can rotate. As the event organizer, I’ve found it easiest to host at my own house. I have probably the smallest house of all of us, but I’m the only one of us who doesn’t have kids, which makes the logistics of a late dinner party a little more manageable. So in our dinner club, I host almost every time. Choose your menu. In our dinner club, the host (me!) makes the main dish, so I often determine the direction of the menu. Once I send out the “it’s Taco Night!” text, everyone else chimes in saying what they’re bringing. Our main categories are: Appetizer, Drinks, Main Dish, Salad, Bread/Carbs, and Dessert. It really depends on the night, but usually most people show up with their recipes already made. We eat apps and have drinks while putting finishing touches on recipes, and then dinner is served! Repeat. Send out the email inviting everyone back! Repeat indefinitely. Every person should know one other person. It’s easier to be fun and social if you know you will know at least one other person – this avoids anyone becoming the weirdo who spends 15 minutes talking about x-y-z only to find that everyone thinks they are totally bonkers. Not a good moment. For our dinner club, everyone knew me and one other person. I chose two friends from college, two friends from my blogging network, and two friends from church. I wanted people to be able to be semi-comfortable right off the bat, and I feel like the know-one-other-person rule helps to make people feel less intimidated. Choose a consistency and stick to it. If you’re just starting, you don’t have to ask people to commit. I think I might have asked people to commit, but I’m awkward. That was probably annoying of me to do. I think you could just say, hey! I read this amazing blog post (why, thank u ❤️) about starting a dinner club and it’s something I’d like to try to do in 2018. Do you guys want to come over and give it a try with me? That implies that this could be more than a one-time dinner party but doesn’t make anyone feel obligated to continue coming in the unlikely event that they come and cannot handle the social-ness. Once you find your core group, I do think it’s helpful to have a consistency. Ours is once a month, although on busy months it gets to be more like once every two months. I set a recurring reminder in my calendar to remind myself to schedule it. Use a scheduling tool. Please, for the love of overflowing inboxes everywhere, avoid hundreds of texts and email back and forth to set a date and just send everyone a Doodle link. I learned this way too late. Make the recipe at least once. I broke my own rule for dinner club last week with that chicken parm and it turned out great, but it was chaotic and I found myself trying to drink wine and eat artichoke dip while simultaneously pounding, breading, and frying seven giant chicken breasts. This rule is not so much for the quality of the recipe as it is for your overall peace of mind. If you’ve made this recipe before and you know what you’re doing, you won’t have to be glued to your phone the entire evening as you measure and chop and fry while trying to have meaningful conversation with friends. Make a recipe that can be done in advance. 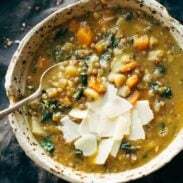 Especially for your first time, and/or if you have a small kitchen, it might be in your best interest to have something that can be baking up in the oven or simmering on the stove when everyone arrives. AKA LOW MAINTENANCE. Breading, deep frying in batches, and baking all while trying to entertain is like Level 100 Dinner Club. Don’t start there. Just keep it simple and try to plan as much as you can in advance so when people come you can just eat chips and hang out like the chill person that you are. Jump out of work a few hours early. I used to be a teacher so I realize this is not doable for everyone. But. If it IS doable for you, block out half of your afternoon schedule so you can get everything ready. I do this EVERY TIME I host dinner club. Let people help you. Last week my friends just started cleaning up while I was still sitting at the table. I tried to protest for like 1/100th of a second and then I was like, YOU ARE AMAZING AND THANK YOU SO MUCH. They loaded the dishwasher and got a start on the dishes before dessert. Amazing. So helpful. Don’t be too cool to accept help with prep or cleanup, otherwise you will be so tired that you won’t ever want to host dinner club again. Embrace imperfection. The second dinner club I ever hosted was curry night – I made this amazing beef and potato yellow curry from scratch, and as we passed the rice around I noticed my friend kind of brushing something to the side of her plate. A weird piece of rice? I thought. Maybe a speck of parsley? OH NO. Not even close. You guys, it was a hair. One of my super long, straight, brown, renegade ponytail hairs in. her. rice. I have no words even to this day. All manner of cool and experienced and trustworthy cleanliness was gone. Guess what? She has still come back every month for dinner club for the last three years. You’ll overcook the chicken, you’ll run out of clean dishes, your beautiful long hair will end up in the rice… these things are all going to happen. You’ll all be fine. Menus To Get You Started! Note: this post contains affiliate links. Thank you for being vulnerable enough to share your story of loss with your reader community. This idea of a Dinner Club is brilliant, I would give anything to live near my small crew, so I could host something like this. Have a great day! I LOVE this idea! We recently moved to a bigger house and I’m so looking forward to entertaining and connecting with friends. I’m an introvert starving for opportunities to build my tribe in the midst of this BUSY life. I’ve got some post-Hurricane-Irma cleanup to do but after that I’M ON IT !! We do a dinner club and love it! For us, it’s long time friends, but our lives get busy and it’s a guarantee that we see each other every couple months! We don’t have a set cadence, but the host sends out a Doodle after each dinner club to set up the next. We rotate hosts, and it is four couples – used to be five, but one moved away. 🙁 The host sets the theme and cooks the main course and usually one other item, and the other couples bring Apps, Salad/Soup, Side or Dessert depending on the menu. Sometimes the meal theme even morphs into an overall theme that requires trips to the thrift store for appropriate outfits. We’ve done a white party, cowboy night and one of our most epic nights – white trash night (think beer can chicken, easy cheese, Little Debbie snacks) complete with many fake tattoos. Then we have tamer nights, like Pigs and Pinot, wine pairing, ethnic food or holiday themes, drunken dinner club (all dishes contain alcohol)… The list goes on. We’ve been doing this for a dozen years or so, and every time we have the best time catching up with friends and laughing until our stomachs hurt! Drunken dinner club! lol! you are awesome. 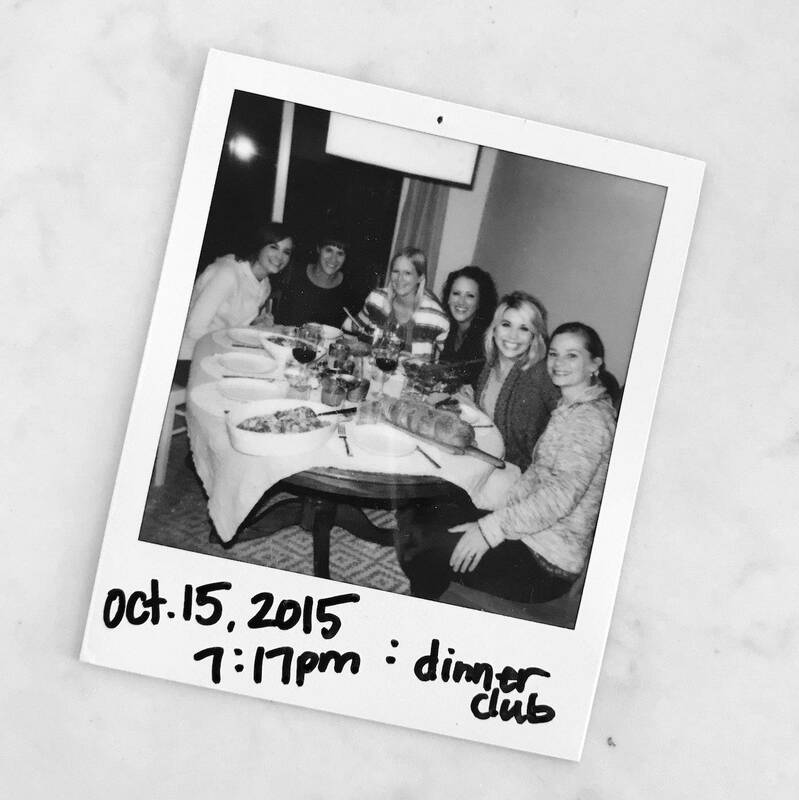 Thank you for sharing about your dinner club! My husband and I are currently house hunting so when we find a place and get settled, this is on my list of things I’d like to try. There is something special about opening your home and sharing a meal with others! We had a very lovely neighborhood Supper Club with couples for a few years way back when. It was so much fun taking turns with each other’s menus and hosting in our homes. The dinners seemed to get more “gourmet” as time went on and required a lot of time for the host. Were we trying to outdo each other? Maybe! Eventually, we stopped Supper Club because a few of the couples got divorced and it was very uncomfortable. I do miss those times and would love to get another one started! Thanks for the inspiration, Lindsay! Now that I have my food blog I know what the theme of my next dinner club will be — Asian food, of course! I’ve been wanting to start a dinner club but we’ve been doing a wine club (though not recently). Each time we meet, the host picks a varietal and we all bring that varietal within a category of region (CA, New World, Old world), best under $10, oddball, sustainable, etc. And we bring a snack to share. We blind taste and rate to figure out what we like. It’s really fun! Too cool! I love it! I am in my 60s and my husband and I were in a dinner group for several years. Those couples became very good friends. Unfortunately we stopped meeting as often as we were because several people changed their diets to vegetarian to vegan. It became really difficult to create a menu to please everyone. I would love to have a second group again but don’t know people to invite. Any ideas on how to create a supper group when you’re not as social as when you were younger? Harriet, I’m sorry to hear that your other group didn’t work out and I think it’s so nice that you want to start one up again. I have only been hosting my dinner club for three years so I don’t feel all that qualified to be giving advice, but I guess my suggestion, if I had one, would be to keep the group small. I find conversations to be easier when there are only 4 people around the table instead of 8. Sometimes if there are too many people it can be socially exhausting. I hope you’re able to make something work that feels right for you! About a year after graduating from college I moved to a different part of the city than most of my friends and found myself a little lonely. 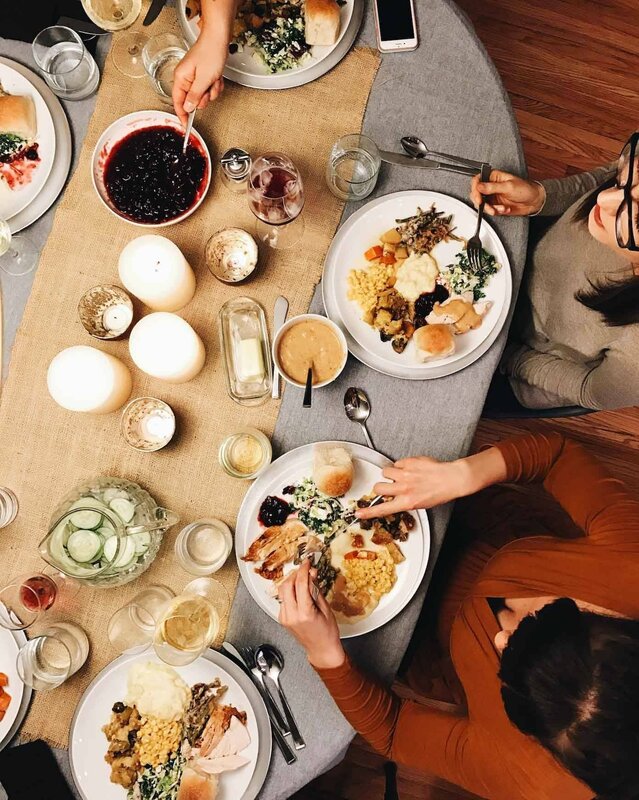 I decided that in order to keep those connections going (and to convince people to come all the way out to my house) I would set up a weekly dinner party. Four years later and it’s still going strong! People come and go, mostly due to life circumstances, but I’ve always enjoyed the group. I’ve thought recently about trying to upgrade the style of dinners I do to be a little classier, but it seemed a little daunting to do that every week. I hadn’t thought of doing it once a month though! The best part is that I have a few in the group who love to cook as well and would likely look forward to a fun challenge. Yeey, That is such a good idea, and it seems like a Big Fun and very nice to be once in a while with all the friends, eating delicious food together 🙂 I like it. This is SUCH a good idea! We have a book club with some girls & usually end up all pitching in an absurd amount of delicious goodies from Trader Joe’s. But this takes it above and beyond & it’s such a great way to find go-to recipes too!! Now I have to rack my brain to think of friends that love food as much as I do! So far I can only think of two… may need people to invite their own friends to make it big enough, haha. 🙂 I just love this idea so much and have always thought it would be so fun. I love having alone time. LOVE it. But having a group to commune with and be able to call on when in need is so important! Another awesome blog post about something we have never done but could/should do! Sounds fun and interesting. My brother and his wife belonged to a DC back in the day and as I recall, they really enjoyed it too. Omigosh, I feel you. We started a book club as acquaintances about 5 years ago and now the ladies in my book club are some of my most steadfast and loving friends. Love to you – this has been a hard year. Thank you so much for this idea! My husband and I are moving halfway across the country in the near future and this is a great idea for making new friends. I was also excited to see the arepa menu. I was introduced to them 20 years ago in Venezuela and I used to make them at home, but somehow got out of the habit. I’m going to make some for my family tomorrow! Lindsay this is such a great idea! I’m totally inspired. I have a group of girlfriends from school and am always thinking we should catch up more – this is such a great way to do it. We do do pot luck dins and they’re super fun, but they’re a little sporadic. So need to get that monthly scheduler on! Has been a little hard too as one of our group of girls (girls, yes def girls, not ladies!) passed away unexpectedly 4 weeks ago while overseas. We spent a lot of time together in those initial few weeks, but this last one I’ve been wondering how to get us together again, and how it won’t be awkward without her? I guess it will be. But just gotta do it. Sharing good food with friends is truly one of my favorite things to do. Great post. Everyone should have a dinner club, it is the best. Yes! Shauna! I want to be SN when I grow up! I’m so glad the dinner club helped you in those hard moments. I was sad to hear from your lose. God knows and loves us more than we get to undestand. My best wishes! As a time-poor empty nester in a new town, I have struggled to develop friendships. I love this idea, or some of the others suggested in the comments, and feel inspired to try it. Thank you! We just moved to a new city and I need this in my life. You’re so right, we all crave connection.